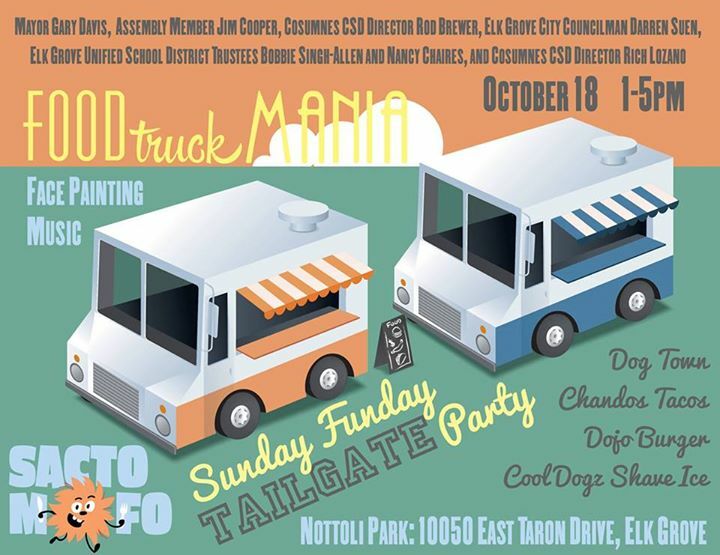 It might not have the buzz of Levi's Stadium or rowdiness of the Oakland-Alameda Stadium before a 49'ers or Raiders game, but a food truck event being held on Sunday afternoon will certainly have lots of great food selection. The event starts at 1 p.m. and food will be available until 5. In addition to the food truck offerings, there will be music and face painting for children. In addition to Cooper, the event is also being hosted by Elk Grove City Council Member Darren Suen, Cosumnes Community Services District Directors Rod Brewer and Rich Lozano, and Elk Grove Unified School District Trustees Nancy Chaires and Bobbie Singh-Allen. If you miss this one you can go to Morse Community Park from 5 - 8 P.M. for the next big event. Never say Elk Grove doesn't play like the big boys....may never get the MLS or Olympics here, but we've covered the Food Truck scene big time. How dare these people upstage Mayor Gary Davis in his own town. He started these food truck events and now everyone is trying to steal his thunder for votes.